NORTH Melbourne has moved to increase its commitment in Hobart to four games a year from next season. 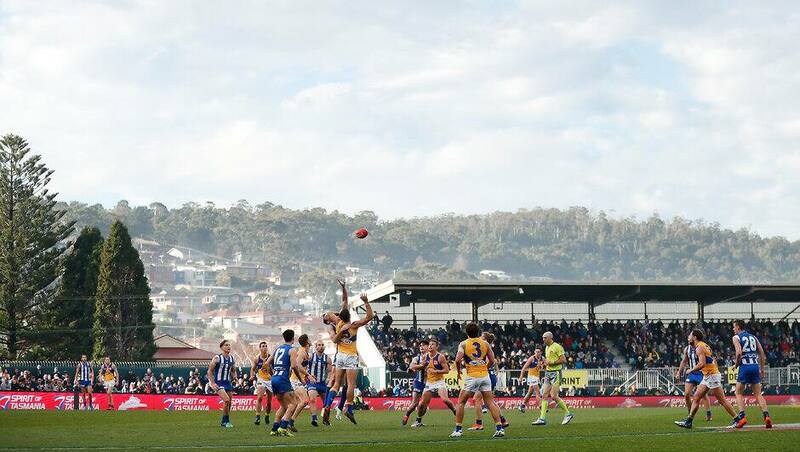 It's understood North flagged its interest in upping its Hobart 'home' games from three a season to four when it lodged its 2019 fixture requests with the AFL three weeks ago. North chief executive Carl Dilena told AFL.com.au this week the club was keen to explore an extra annual game at Blundstone Arena, but had to address several issues first. "Our partner, TT-Line, is very keen for a fourth game and they always have been," Dilena said. "They want to make sure that they can fill up the year with games. They see it as too long a gap between games at the moment with only three, so they would like a more complete season. "We're happy to consider that with them. If it's possible for the AFL to do it with the fixture and the new stadium arrangements and if it makes sense for us, well then let's have a look at what the model looks like. "We have to make sure that it works for all parties involved and, most importantly, our members." Blundstone Arena has been an extremely happy hunting ground for North. Since 2012, it has won 14 of 18 games there – at a remarkable 78 per cent success rate – including its past five straight. Dilena said North's football department would fully support an extra game in Hobart provided it didn't compromise the club's fixture. "From a footy perspective, it's been great for us in terms of winning games down there and we're getting positive feedback from members and people who go down to Hobart for games," he said. "The only question mark is travel, because I think in the fixture to date the AFL has seen us playing in Hobart as a home game rather than a travel, which has meant we've had back-to-back away trips a couple of times around Hobart games." North's existing contract to play in Hobart runs until the end of 2021. At this year's NAB AFL Draft, North will get the chance to select a member of its Tasmanian Next Generation Academy for the first time, with Tarryn Thomas widely touted as a top-10 talent. Despite the obvious appeal of picking one of their Academy products, Dilena said North would make an unemotional decision based purely on how early a rival team bid for Thomas. "I think it would be a nice thing, it would fit well with our Tassie relationship," Dilena said of drafting Thomas. "But in the end our recruiters aren't going to make a list decision based on a nice fuzzy feel. They've got to do their job and that's to pick the best available talent."